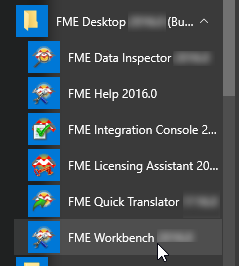 Find FME Desktop in the All apps area of the Windows start menu. Click FME Workbench in the submenu. Note: Depending on your version of Windows, the start menu may look different. The Getting Started and Recent Files areas provide options for creating new workspaces or opening existing files.